MegaDrop are Raphael Pepi (Helios) and Ross DuBois (Random). 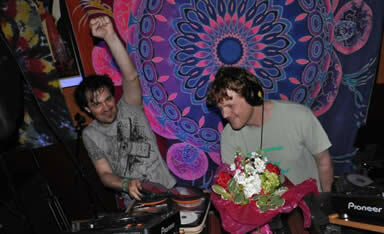 They are a full-on psy trance duo from San Fancisco on Logical Light Productions in California U.S.A. They have recently done a dark brooding remix for Aphid Records of the 'Trancelantic' track by Aphid Moon and Helios which is also on the 'Trancelantic EP'.